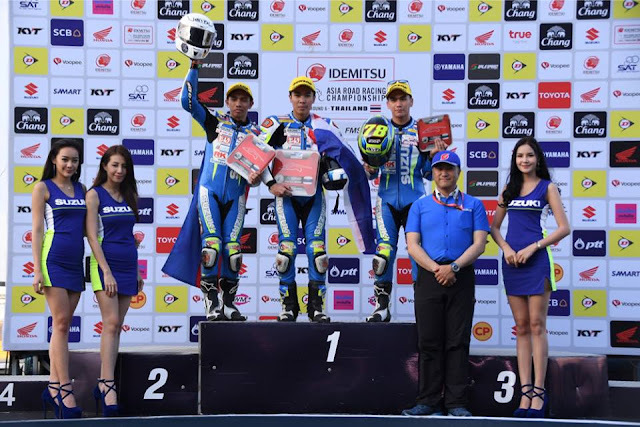 After a series of podium wins and head to head battle with other Asian contenders, Team Suzuki Pilipinas concluded the Suzuki Asian Challenge (SAC) 2017 which runs in conjunction with the FIM Asia Road Racing Championship (ARRC) with a 2nd Overall Championship win - a first of the country at the said single-make race hosted by Suzuki Motor Corporation and is produced by Team Kagayama. The final round saw the country's frontrunner April King Mascardo (#16) and Eane Jaye Sobretodo (#22) working together to secure the former's overall standing at 2nd place. On to the qualifying, both were on a good start but Mascardo low side crashed mid-way to his first lap which required him to go out of the track to have his bike fixed. With only 7 minutes remaining, Mascardo went back on the track and still managed to get the 4th position on the grid. Race 1 showed Mascardo achieving his 4th podium win of the season with a 2nd place win against contenders from Thailand on their homecourt. Race 2 capped with Sobretodo preserving the pace of the lead pack for Mascardo to catch up from the 2nd pack which he successfully did. Getting the championship title is Punchana Kulrojchalalai of Thailand who also got the 3rd and 1st podium win during Races 1 & 2 respectively. Following on 3rd place is Japan’s Tetsuya Fajita who finished 2nd place on Race 2. Overall Standings 2nd Overall – April King Mascardo 8th Overall – Eane Jaye Sobretodo 9th Overall – Mario Borbon Jr. Team Suzuki Pilipinas raced this season with strong contenders from Australia, India, Indonesia, Japan, Malaysia, Nepal, Sri Lanka and Thailand. This year, the SAC riders competed on board the revolutionary Suzuki GSX-R150 – the sportbike that will transform the lightweight class. Taking design inspiration and technology from the GSX-R1000R, the GSX-R150 is a fully faired sportbike bearing the same DNA of Suzuki’s champion motorcycle – GSX-R1000R. The new GSX-R150 is the newest addition by Suzuki to the Asian market which uses a backbone frame. The street version has a size of 2020mm X 700mm X 1,075mm, with a wheelbase of 1300mm. The weight is 131kg with an engine of 147.3cc with a maximum horsepower of 14.1kW. SAC modified this base machine geared towards racing. The team’s performance at the SAC 2017 Season underscored that the objectives of the race are achieved. Exposing and training these riders to be world class champions is the main advocacy of the program. This historical win also proves that the Filipinos are a strong force to be reckoned with in the world of motorsports.